That's amazing! I just googled my name And found actual photos of my own family. My name is Dalton James Elliott. I believe From talking to my grandmother and grandfather that James Dalton Elliott is my great, or great great grandfather. I am positive of this because I hear so much of the Lanier name and the correlation of all our family names, like James, Irvin, and velma. Thank you so much for posting this and I would love more information if you have any! 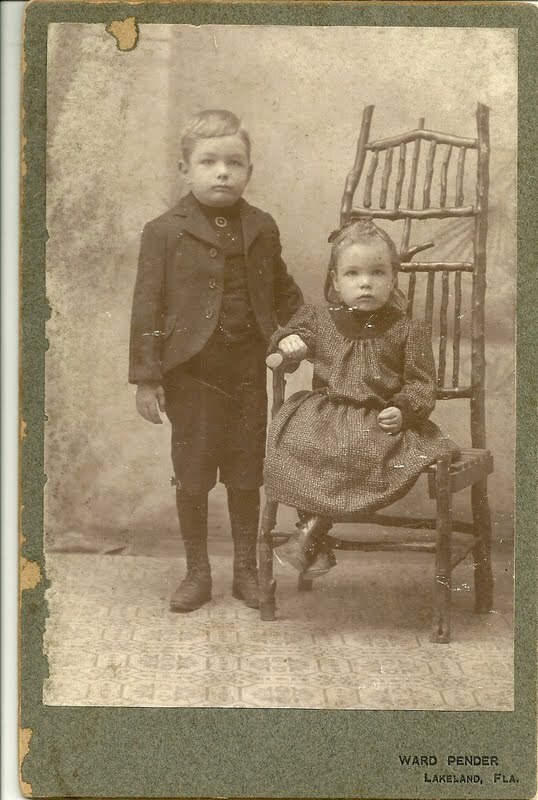 I'm so pleased that you found this photo of your ancestor and his sister! I wish I could tell you where I found it - but it's probably the only item that I have of your family. Unless - and you could ask your grandparents - the accompanying photo belongs to your family as well. Thanks for commenting - and making my day! Glad you happened by! And thanks for the extra information. I have a picture I found that had the same photographers photo. It has a different couple but identical set minus the dresser. My email is troyburris04@yahoo.com 352-585-6425. Wish I knew more about the photographer, but I don't, sorry. This is the site I usually check - a database of 19th century photographers, but I don't see Ward Pender on there: http://www.langdonroad.com/. It's possible the studio didn't start until the 20th century. Is the couple identified? The woman in the second photo taken in Ames, Iowa is Elsie Elliot Ramsey b. 19 JUN 1900 in Ames, Nevada Story, Iowa she d. 12 FEB 1991, as a widow, at the age of 90 yrs, 8 months in a nursing home in Durham, Durham, North Carolina, USA. She was the d/o Lewellyn Ansel "Lew" Elliot and Effie May Roseburrough. She had roots in Canada and to early Colonial America going eventually back to England and Scotland. She lived with her parents and worked as a stenographer for many years before finally marrying in late 1943 when she was 43 years old to Mr. Ramsey (I've been unable to locate his first name). She and her husband lived in Winston-Salem, NC. I have located the wife of one of her 1st cousins, twice removed, on her maternal Roseburrough side on Ancestry and have written to her. She also has, through her deceased nephew Dr. Homer Freeman Elliot, a grand-nephew Roger “Denny” Elliot of Little Rock, Ark and grand-niece Rose Ann Elliot Hite of Rockport, Texas. They are not on Ancestry, but I've been searching for them or their kids/grandkids on Facebook. Who knows they may already have a copy of this photograph. My connection to Elsie is very, very, distant. Her face reached out to me from my PC monitor and I decided to let the detective in me go to work. I've attached her photo to her in my family tree. Ah, I so empathize with "reached out to me from my PC monitor"! So likely no relation to the children, then? I should make a post for her herself to make it easier for any relatives to find this photograph. She has such a lovely expression. In my research, I found no connection between she and the children in the photo taken in Florida. And so true, she does have such a lovely expression in the photo. Making a separate post for her would probably make it easier for family to find the post. I forgot to mention, she lived in Ames, IA all those years with her parents before she married in Dec 1943. I have a photograph of the house she lived in with her husband in Winston-Salem, NC. She is listed as the informant on her father's death certificate in 1969 and is listed as Mrs. Elsie Ramsey. It appears her father left Ames, IA to live with her in Winston-Salem once he was widowed and older and she took care of him (his usual residence is listed as her address on his death certificate). Not sure if this additional information is helpful, but thought I'd add it. My Great, Great Grandfather is Dudley Dalton Elliott. His Son Dudley Irvin Elliott was my grandmother Kathleen L Elliott's dad. We are distant family. I have been trying to find a picture of Dudley Dalton and (his wife) Ida Elliott. Do anyone have a photo they could share? I have a heirloom (cabinet) that Dudley Dalton Elliott built in 1907 for his wife Ida my great, great grandmother. I have been unsuccessful in my find for a picture can anyone help me? I don't have another photo to show you but hopefully a future reader will scroll down to the comments and contact you!